By Alice Sherratt, Race Organiser. 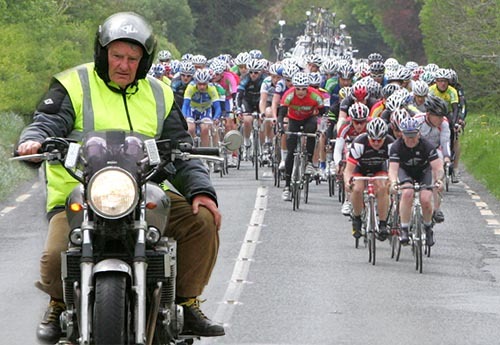 The Usher Irish Road Club is proud to announce the staging of the 50th Anniversary Gorey 3 Day Cycle Race this Easter. The event is the biggest and longest running of its kind and caters for 2nd and 3rd category riders of all ages. The race has come a long way since its beginning back in 1967 when Peter Doyle Bray Wheelers took the win. Other famous winners the “King of cycling” Sean Kelly who won as a junior in 1973. Mark Scanlon and Daniel Martin also took wins and went onto professional ranks. I happened to be on the first one along with Terry Curran and I can tell you that our accommodation was a Tent as we were marshalling. The weather was dreadful and we sat up all night. Harry Sherratt was also there but he was riding the event so he stayed in Redmonds Hotel, now the Loch Garman. Phil O’Brien our chief Commissaire for the last twenty five years also rode that first year. In those early days the race started in Bray and travelled straight down the N11 racing right through Arklow Town to finish on Gorey’s main street. Imagine that today! There might only be one lead car and as for a Motor Bike we had Terry Curran on a Honda 50. Being up till four in the morning doing results in the Parish Hall. No computers in those days. Results done by hand on cards. Many stories can be told about this great race like “A horse jumping into the main Field” running alongside the riders. “Rider going through the back window of Mick Lawless’s Broom for a wee rest.” Freddie Smyth being lifted off the bike at the Finish in Bray suffering from Hypothermia” “Stopping the race “when it went off course, and many more. A first last year calling in a Helicopter for a race accident. These are memories that one will ever forget. However things have changed and improved much over the years. The race is longer and a great deal tougher. We have many lead cars and Thanks to John Ryan a squad of Motor Bike marshals. We also have three Commissaires, Timekeepers and Judges and Neutral Service cars. Whilst the race is promoted by Usher Irish Road Club we could not do it without the help of many good friends from cycling clubs all over Ireland including the local clubs Gorey C.C. South East Road Club and Slipstream CC. This event could not take place without the help of the Gardai on route and the Gorey Red Cross. For many years the man behind the famous 3 day Sam Darcy was always in the thick of action on his motorbike. Picture from the 2011 event by Peter Purfield. This year’s winner will have his name engraved on the Sam Darcy Memorial Trophy. Sam rode the first event and played a pivotal part in the running of every “Gorey”, usually as Race Director, until his death in 2012. This race was the brainchild of Sam and his wife Betty who did untold work on the event. A huge Thank you to all who make this race possible and remember it is all voluntary. Stage 1 Sat — 15th April 100 Kms… Leaves Blessington at 12 noon and travels via Baltinglass, Hacketstown, Tinahely, Carnew, Craanford, Camolin and Gorey to finish in Craanford at about 2.30. Stage 2 Sun — 16th April 120 Kms…Starts at the Monument at 12 noon and completes 5 laps of the Gorey- Cranford-Camolin Gorey circuit to finish at the 50Km sign at about 3 PM.